You can find Grace here and here on Ravelry. 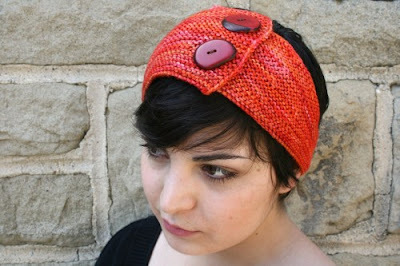 All the patterns shown are available on her site or on Ravelry. I find my inspiration in color. I love mostly all colors. I usually start to swatch first and play with stitches before I know what anything will be. Sometimes the texture of the yarn will speak to me as well. Short-rows, by far. 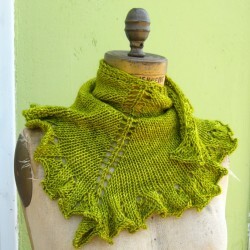 But I do love lace too..... combining the two is even better - like my newest pattern Olga's Vest! I usually make one size first (medium... it's a good place to start) and see how flexible the garment is. For example, my Janna's Tunic I sized it from S-XL. I made the XL to fit me.... turns out the S size fit me too, so I decided that this garment is very stretchy and I didn't really need to size it any larger than XL. I absolutely look at other designers work. I think one's design is a reflection of the way their mind works and it's nice to see how other people think about and view knitting designs and construction. For example two of my favorite designer's are Olga Buraya-Kefelian and Julie Weisenberger for their great eye and construction. But I have never fear being influenced by other designers work, I would say that sometimes I am inspired. I don't see anything wrong with that. It doesn't take that much extra time for a designer to explain a couple of techniques to broaden their market. Beginner knitters are already limited when it comes to patterns, why not expand their choices and increase their skill level?! I do most of the sample knitting myself and some of the test knitting as well. Right now I only have about two sample knitters working for me and about 3-4 test knitters. This position has not yet been filled - but I am taking applications. Ha ha! I just kind of fell into all of this, no mentor yet, but it would be nice. No. I just do what makes sense. I would say that it has increased my pattern sales of course, but for me it's all about the LYS. I would say that a lot more LYS carry my patterns in hard copy after seeing them on Ravelry. I do all the tech editing my self. Sometimes I do miss things (like little typos) here and there, but for the most part I do catch everything. I have been thinking about using a tech editor for a while (to lighten my workload), but I haven't found the right one yet. That is a very good question. What most people don't know is that I have a full-time job on top of the designing career. It is very difficult to juggle the two. My personal life suffers for this great cause. After a full day at work I come home and work on my patterns for about 6-7 hours and on weekends as well. I leave a little time here and there for grocery shopping, and things like that, but for the most part (at this point in my life) work is a priority. I take it for what it is. If someone has an opinion about my work I want to hear it, good or bad. Just like I have an opinion (and I always do) I would want mine o be heard. Constructive criticism is always the best, it shows there is room to improve. I'm still not quite there yet... unfortunately. I live in LA - it's quite an expensive city. I hope one day (soon) I am able to support myself. Do what you love and success will follow shortly.